Additional Spaces can be defined as needed to match the CSS design. TIP! Explore the scope options carefully when inserting on a page. You may end up adding more text dynamically than you expect. All the Scope options are available when configuring a new Space to your website. The Scope of a Space will be shown by colour of the space when the lenses or insertable objects are showing. 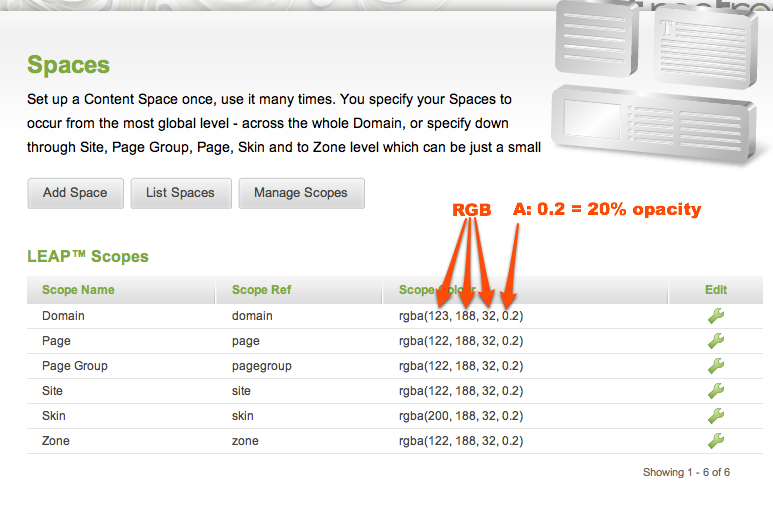 You can configure the colour of each Scope so that they are easy to see on the skin of your site. The defaults are typically pale green and yellow, and are shown as RGBA values - where A is the value for the opacity.